BROOKLYN, New York — It was 40 minutes to tipoff, and 11-year-old Colin Tsai was lined up with two-dozen Taiwanese-American kids who were chosen to appear on the court Friday night at the Brooklyn Nets’ 2016-2017 season home opener against the Indiana Pacers. For anyone of any age, standing in front of thousands of people as the National Anthem is sung in a darkened sports arena is a special moment. For Tsai, even more so because his idol, Jeremy Lin, was also on the court alongside his teammates, directly facing him. “He’s inspired me to become a better basketball player,” Tsai, a guard and small forward with the Wilton Warriors in Connecticut, told NBC News. Tsai and his father, Mark, were among the hundreds of Asian Americans who filled a packed Barclays Center Friday to watch Lin and the Nets play their first home game of the season. Some wore black-and-white Nets jerseys with the Harvard graduate’s last name and the number 7; others held up posters and banners, including one that said “Brook-Lin." There were young and old, male and female, all encouraged by the 28-year-old’s underdog story — his meteoric rise in the NBA beginning with the New York Knicks in 2012, and the phenomenon that came to be known as "Linsanity." There were also kids of all ages — boys and girls whose parents drove hours after work from Long Island, New Jersey, Connecticut, and even upstate New York to show them what an Asian-American role model looks like. Dean Lin, who brought his three children — ages nine, seven, and three — to the game from New Jersey, called Lin a player who is smart and tenacious, and who is breaking stereotypes. 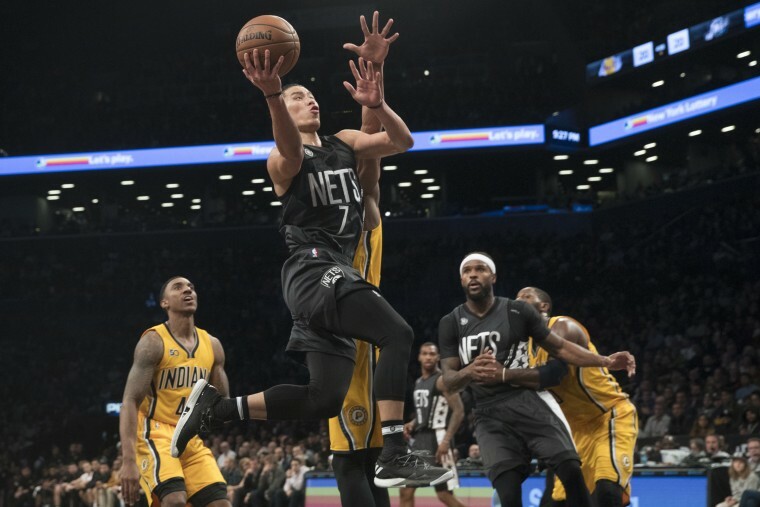 The sellout crowd of 17,732 in Brooklyn saw a solid performance from Jeremy Lin, who scored 21 points, with nine rebounds and nine assists, to help the Nets defeat the Pacers 103-94. Before the game, head coach Kenny Atkinson was asked by reporters how Lin has changed as a player and a person since he’s known him. The two go back to Lin’s days on the Knicks, when Atkinson was an assistant. For Namema Amendi, who was sitting with a group of 200 Taiwanese Americans who bought tickets through the Taiwanese American Association of New York, Lin’s success story has universal appeal. He said he’s inspired by how Lin carries the weight of his community on his shoulders every time he steps foot on the court. Colin Tsai is one of those people. Just like when Lin was a teen, the 11-year-old has earned a spot on an Amateur Athletic Union (AAU) basketball team in his home state of Connecticut, his dad said. “He might not be the biggest player on the team, but if he can use his right and left hands to dribble and handle the ball, it gives him an opportunity,” Mark Tsai said of his son. He credits Lin for helping to break stereotypes that Asian Americans excel only in academics, not in sports, and for giving kids like his son a chance they once might not have had. “He’s really paved the way for Asian Americans,” Mark Tsai said. A Nets’ win Friday night looked tenuous at times. Coming off a loss from the Boston Celtics the night before, the Nets were down seven points at the end of the first period. They led the Pacers 52-48 going into halftime, though ended the third period with another seven-point deficit. But then the Nets came back to tie it in the fourth, 83-83. With six-and-a-half minutes left, they gained a six point lead in less than two minutes. That’s when Lin, who had been substituted out, came back in. Thanks to a three-pointer, some free throws, and rebounds, the Nets’ lead expanded to 10 points. Then, with one minute and 41 seconds remaining, Lin fans got the climactic moment they’d all been waiting for: Lin to the foul line. Buoyed by chants of MVP, Lin. who signed a three-year $36 million deal with the Nets over the summer, made both shots. And if that wasn’t enough, he punctuated his performance with a two-point jump shot with a minute and seven seconds remaining. The crowd was electrified. Back in the locker room postgame, dozens of reporters, many from Chinese-language media, surrounded Lin as he quietly put his jeans and shirt on after showering. Asked what he was thinking about in those final moments of the fourth quarter, when he was dribbling out the clock, Lin said he took a deep breath and looked around.